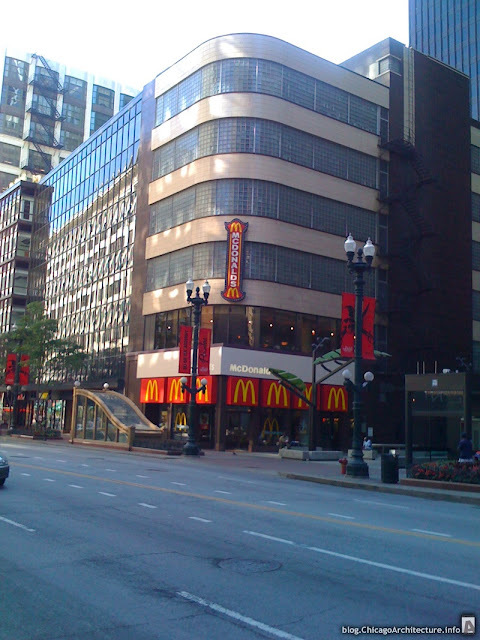 One of downtown Chicago’s least pleasant looking McDonald’s looks much better these days. The restaurant at 230 South State Street has been given something of an exterior makeover. There are clean new awnings, a light grey McDonald’s banner wraps around the corner of the building, mimicking its structural stripes, and even the marquee looks a lot better than it used to. Other people seem to have noticed, too. When this picture was taken, people could clearly be seen eating in the second floor dining room, something I haven’t seen before. It’s another positive step forward for the revitalization of State Street. It looks good, but how long will it last? I have seen more crazy stuff outside of that McDonald's than any other place in the city. M M M M M M M. Enough with the giant "M"s, Mickey-D's! i just realized all those giant "M"s can be read as "mmmmmmm… that's yummy". Ok, it's growing on me now.